September is, for many academics, the conference season, but they occur all year, and this post is borne from decades of bad coffee, overstuffed powerpoint slides, humble-brag introductions, and unspeakable ‘social event’ experiences. 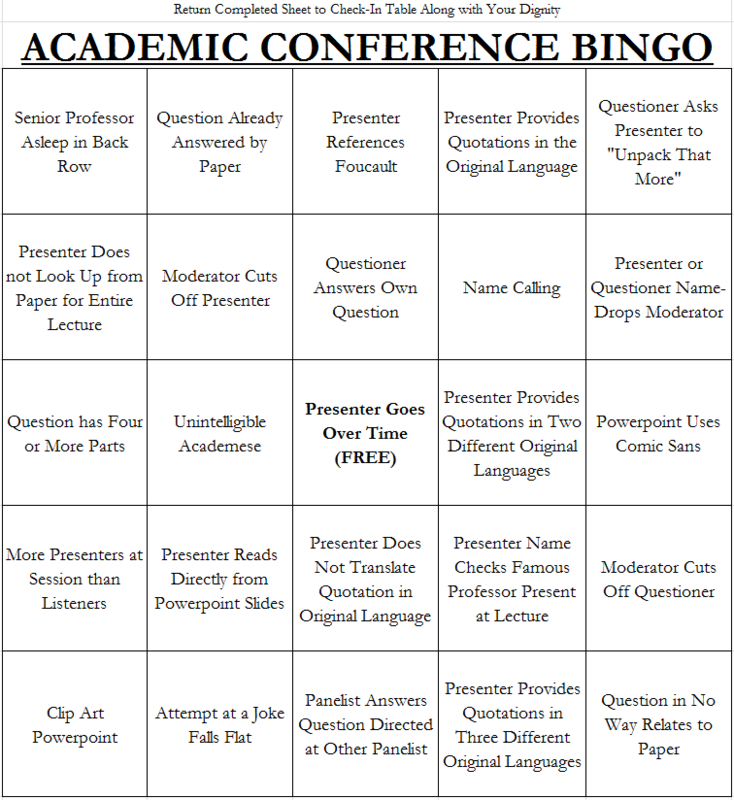 Much of the behaviour I discuss here can be found in more general academic contexts, but there are two reasons for focussing on conferences. Firstly, they seem to invoke particularly concentrated cases of the behaviours I am discussing, and I might speculate that the platform they give, and the extended, and often new, audiences are factors in this concentration. Secondly, they often represent a specific nexus of anxiety, and point of transitional discomfort, for postgraduates, moving from a ‘student’ mind-set, towards being academics, with something of their own to contribute. What this post is for, is to call time on some, what I see as pretty unacceptable, practices – and to have this dovetail with the work on resilience and on vulnerability, that I have been doing with colleagues. This is largely in the sense of stripping out excessive ‘trial by fire’ mentality, and the idea of a macho, toughness, and replacing it with the sense that we are engaged, at conferences as we are more widely in the academy, with a collective enterprise: that of learning about the world, and communicating this. So, what do I specifically have in mind? When you encounter postgrad papers, where they clearly don’t have answers to your question – don’t ask it! It is tempting to get a cheap ego-boost, but don’t be that person. You might suggest that they look at X, or Y – but this isn’t a question. And you were told that this was a Q & A, so maybe leave it and talk to them supportively afterward, Without an audience. The conference Q&A is a chance to model that most, you’d think, obvious ethical practice of being kind, and not worrying that this is a lack of rigour, or challenge. There is room to do these things in ways that empower colleagues to produce better work. To paraphrase something Dr Rivers and I said at an event recently, we don’t want to behave at conferences such that postgraduates and early-career colleagues believe that they need to become hard, tough, gritty, parodies of a nostalgic Wild-West masculinity in order to succeed and thrive in academia. “I’m Just Thinking Out Loud here..” – really? Why would you do that? Are you really, or just playing for time, as it seems that you can’t bear a session where your voice isn’t heard? “I enjoyed your paper, but just had this one short thing to say..” Not a question, but normally the preamble to a ‘correction’, which shows that the only thing they enjoyed was the anticipation of making a public correction. “I’m no expert, but isn’t it obvious that…” Wow. Is this ok? To say that despite the paper giver being an expert, they are so wrong, that even a non-expert (like the ‘question’ asker) can see it. Totally agree. The first time I went to an academic conference, I was horrified by the behaviour – and I’d come from media where behaviour is often, um, robust. I continue to be less than impressed by the inherent points-scoring in many of the questions, and by people who over-run considerably on their papers because they think the rules don’t apply to them – and by the chairs who don’t quietly pass them a note to tell them they’re running close to time. I do agree about being kind…. I have seen some real egoists take the microphone to only promote themselves rather than engage with the speaker. Hoping for a little kindness during Q&A at my next conference in November.. Fingers crossed…. I’ll let you know! Maybe my example is just prevalent in the Business / HRM conferences, but our Postgraduate researcher sessions have strict rules that we only make positive and supportive comments. this is made clear at the start of all sessions to which it applies. This helps boost a supportive culture that brings people in to the fold. Those who don’t adhere are taken aside after the session in question and educated by the ‘seniors’ about saving the combative mode for the full conference sessions. Many years later I like causing a brouhaha at conference and waiting for the combative questions. But that is with 20 years of experience and self confidence that grew from the support I had a s PG student. My only pet hate now is the 15 minute question (usually from a historian of philosopher, I have to say). Stop showing off and let others have a chance. The key role of career-mature (!!!) academics is to bring on the next generation in my view and we do this by nurturing, supporting, challenging and engaging them rather than demeaning them. I nearly left academia early in my career due to the unpleasant antler rattling I encountered at conferences. So nowadays us later career academics have the responsibility to call out poor behavior by our peers when we see it even if it means getting a bit antler-bashed! When that one person gets the microphone with one question (no, it’s three questions which they’ll go on to answer for you over the next 10 minutes).